Having just returned from another successful group trip to Europe, my mind is replaying all the amazing moments of the journey. And it brings to my mind, Why Wouldn’t You want to travel on a group trip with us? So let’s talk about that and see if we can’t dispel some of the myths about group travel! Yup, we’ve all seen it, the tour guide holding the “whatever” high and saying, “Follow me.” or “We’re walking this way.”, and being followed by a mass of gawking tourists. OK, I get that, but when you go on a customized small group tour like we offer, that’s not what we do. Yes, you are in a group, and yes, you do follow a tour guide, but it’s personalized and we don’t use any form of leading stick because I’m there behind you, making sure you don’t get lost. 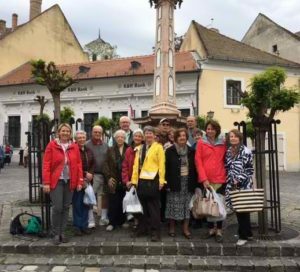 A group of 15 – 20 makes it feel more like friends traveling together than just a group of tourists. Tours are necessary if you want to get the history of what you are seeing. Sure, you could go on your own, do some research and possibly know the names of the buildings or statues. But our guides go into detail and bring what you’re seeing to life. We understand that and we schedule LOTS of freetime for you to wander and explore on our trips. The whole purpose of traveling to other countries is to enjoy the atmosphere, soak in the culture, use public transportation if you want and relax with a beverage and people watch. We also offer flexibility so that if you’re not interested in a particular tour, as long as we’re not changing cities, you can stay at the hotel or wander on your own. On our customized tours, if we include dinners or even lunches, they are not buffets. We always have sit down service meals in local restaurants included, and if we’re in the same town for more than two nights, you have at least one night free to choose when and where you want to dine. Again, we want you to have the freedom to enjoy where you are on your terms. I know, the internet offers EVERYTHING cheaper…..or does it? And is that REALLY what you want to focus on? Here is the honest truth. I am one of the lucky people that REALLY loves what they do. I get an absolute thrill when I watch my clients enjoy their trip, so the itineraries I put together are done with their joy in mind. I choose the hotels for their location and service, I choose restaurants known for serving local cuisine and I choose tours that give my clients a taste of the iconic, as well as some off-the-beaten path experiences they may not find on their own. I get better pricing for groups because of the number of people as well as packaging items together and I make it seamless for my clients. There is never any worry of how they are getting where they need to go and I use local guides that live in the area, that know the history and culture because they live it. Of all of the group trips I’ve escorted, I have NEVER had a client come back to me and ask, “So WHY did we pay that price again?” Not because they have deep pockets or aren’t concerned about budget, but because in the end, it’s about the experience and not the price tag. You can ALWAYS find it cheaper on the internet, but I can guarantee you won’t have as good an experience! So WHY WOULDN’T YOU travel with us on one of our group trips?? If it’s not your idea of a great vacation, I hope some of what I’ve said has made you see it differently. But if not, we can always customize a trip just for you, so let us know if we can help!